How far has Apple fallen from the tree? In the eyes of your everyday consumer, Apple can do no wrong. Unfortunately, that hasn’t translated into today’s world of technology as well as the Internet of Things (IoT). Apple’s slow descend from being a top-tier player in the consumer tech industry has been a long time coming, much to the amusement of fanboys who are very much against it. Suffice to say, this has been a long time coming as well. It was the year 2007 when the first ever iPhone hit the market. Back then, it was met with an uproar from tech enthusiasts, many who dubbed Apple as a “game changer for the industry.” Over the years, we have seen Apple time and time again impresses with its onslaught of devices, especially when it came to its iPhones as well as its series of Mac computers and laptops. However, there is a time and place for everything and that was in 2014 when the iPhone 6 and 6 Plus were first launched. The Apple iPhone X on display at the Apple Store. This is primarily due to the exorbitant pricing that came with the latest iPhones. When the iPhone 5 was first launched, it came in three different price points — US$199, US$299, and US$399. When the iPhone 6 rolled out it was priced significantly higher, starting from US$649 and US$749 for the iPhone 6 Plus. From then on, every subsequent iPhone to enter the market came with a large price to pay. All that culminated into a massive ruckus when the 10th anniversary iPhone was released, the iPhone X. While it did come with many state-of-the-art features that were never before seen on any iPhones, its price tag was a big turn off for consumers. Fortunately for Apple, many users still clamoured to stores worldwide to get their hands on the iPhone X. This led to Apple releasing a supposed update to the iPhone X known as the iPhone XS. Now here is where it gets tricky. In order for the sales of the iPhone XS to blossom, Apple discontinued production of the iPhone X on 12 September 2018. However, on 22 November 2018, Apple has reportedly resumed production of the iPhone X due to the weak sales numbers of its successors. Because of this, Apple was forced to cut down on production for its latest iPhones by 10%. 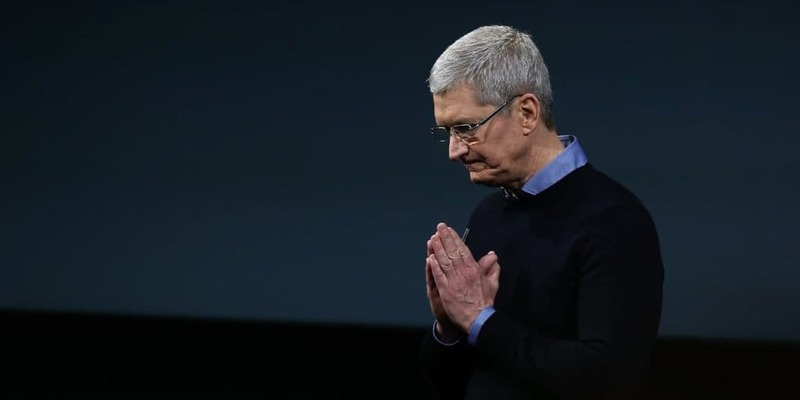 CEO of Apple, Tim Cook issued a statement after Apple’s stock fell after it cut its sales forecast for Q4 of 2018. How could this happen though? Apple has always outperformed itself in terms of sales, especially when a new smartphone was released. One good reason could be pointed towards the lack of innovation put into its smartphones in recent years. In order for a user to be fully connected through iOS (Apple’s proprietary operating system), one would need to invest in all of its devices to maintain the ecosystem. From then on, it’s a matter of constantly upgrading the devices year after year if the wallet permits. Another reason for Apple’s slow descend from grace could also stem from the fact that its price points do not match up against its competitors — mainly Android devices. The last couple of years has seen the upward trajectory of Android devices, especially from the many smartphone brands in China. According to TrendForce, with the way Huawei has been performing, it could very well knock Apple of its perch for second place and put itself right behind Samsung. 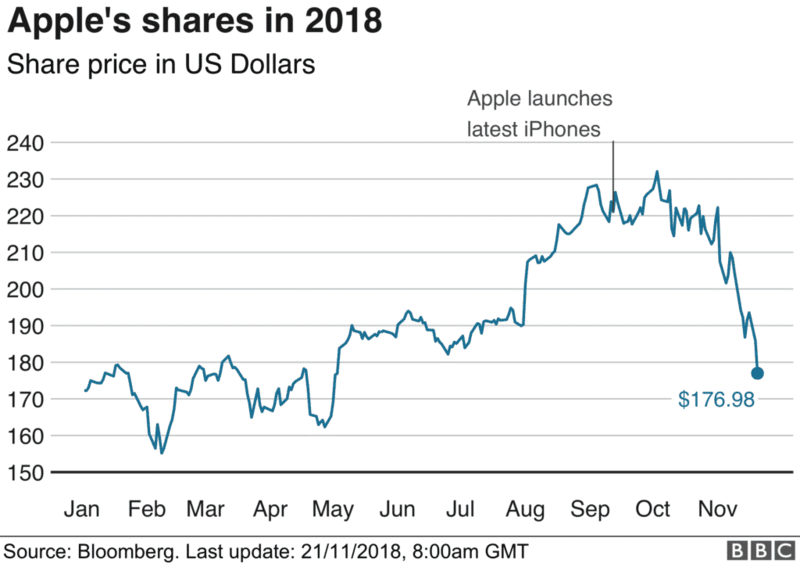 A graph from BBC showcasing Apple’s growth and eventual decline throughout the course of 2018. Earlier this year, Apple’s stock fell after it cut its sales forecast for Q4 of 2018, which saw its figures dwindling from all of its devices. Apple’s stock also dropped by 7.45%, which took away US$55 billion from the company’s value. Unfortunately, this is also due to the current trade war going on between the US as well as China, which considers Apple to be at “the forefront of vulnerability”, according to Forbes. 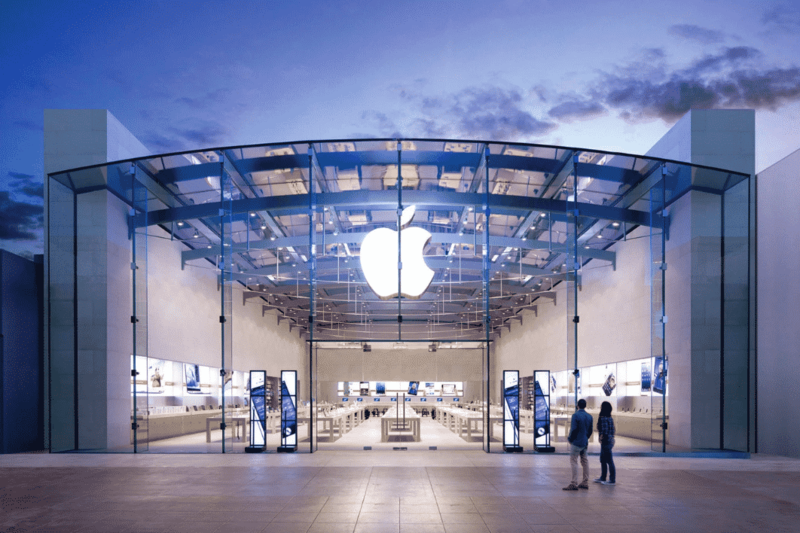 With how 2019 is shaping out to be for Apple, it is only a matter of time before it becomes just another tech company that had its run in the spotlight for far too long. Think along the lines of Nokia and Blackberry, both of which were respective market leaders at one point of time.